Garden Decking in Aldershot, Farnham and Guildford, Surrey. A well thought out, correctly installed deck can be a great addition to any garden.It can not only look stylish but if designed correctly is a great way of linking the house to the garden. Decking is also great if you have slopes in the garden, you can easily turn these unusable areas into a level,stable and usable garden area,you can also add balustrades and steps to complete the look. Timber decking is the most popular choice for most,mainly because it natural product which makes it more suited to the outdoors as well as being sustainable and eco friendly. It is also cheaper than upvc and composite decking so is great if your on a tight budget. Some disadvantages are that it is susceptible to rot, warping and cracking and can be slippery if not maintained properly.This is why you need to carefully consider wether you choose soft or hard wood deck boards,there are also anti slip products available.Soft wood is the cheapest option but these must be pressure treated.However in recent years hardwood deck boards have become more popular,these are more expensive but will last a lot longer,so over time represent good value for money. Other deck board options include upvc and composite deck boards.These will last much longer being man made but can lack the natural appearance. However there is no sanding or sealing required so very low maintenance. What ever deck option you choose the most important bit will be the frame work. 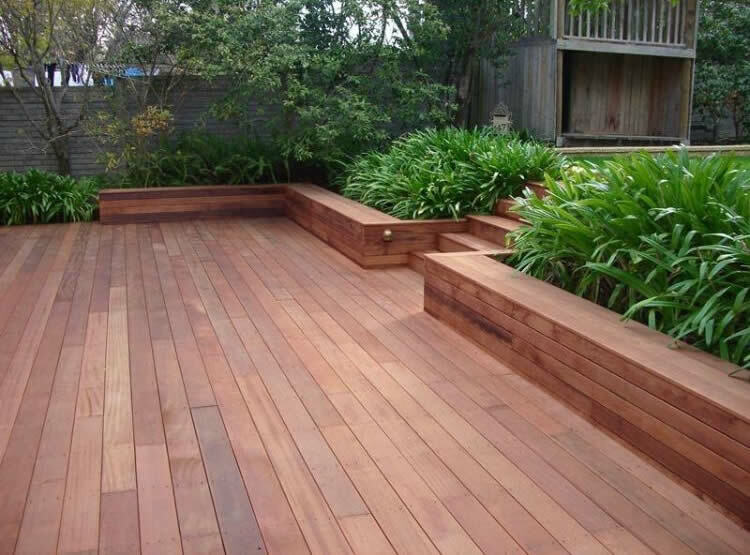 This will also need to be pressure treated timber and preferably built on concrete footings to give a strong, long lasting base for your deck. At GJL paving and landscaping everything we do is to the very highest standards and definitely built to last. We can offer various decking solutions in the areas of Aldershot, Guildford, Farnham, Farnborough, Camberley, Reading, Basingstoke and Bracknell or any other area in and around Berkshire, Hampshire and Surrey.